The Moon Moon symbol Full moon in the darkness of the night sky. It is patterned with a mix of light-tone regions and darker, irregular blotches, and scattered with varying sizes of impact craters, circles surrounded by out-thrown rays of bright ejecta. The Moon is in synchronous rotation with Earth, always showing the same face with its near side marked by dark volcanic maria that fill between the bright ancient crustal highlands and the prominent impact craters. It is the brightest object in the sky after the Sun, although its surface is actually very dark, with a reflectance similar to that of coal. Its prominence in the sky and its regular cycle of phases have, since ancient times, made the Moon an important cultural influence on language, calendars, art and mythology. The Moon's gravitational influence produces the ocean tides and the minute lengthening of the day. The Moon's current orbital distance, about thirty times the diameter of the Earth, causes it to appear almost the same size in the sky as the Sun, allowing it to cover the Sun nearly precisely in total solar eclipses. This matching of apparent visual size is a coincidence. The Moon's linear distance from the Earth is currently increasing at a rate of 3.82±0.07cm per year, but this rate is not constant. Several mechanisms have been proposed for the Moon's formation 4.527 ± 0.010 billion years ago,[f] some 30–50 million years after the origin of the Solar System. 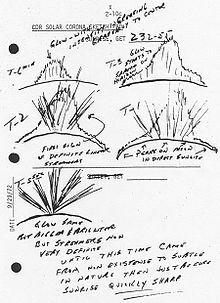 These included the fission of the Moon from the Earth's crust through centrifugal force (which would require too great an initial spin of the Earth), the gravitational capture of a pre-formed Moon (which would require an unfeasibly extended atmosphere of the Earth to dissipate the energy of the passing Moon), and the co-formation of the Earth and the Moon together in the primordial accretion disk (which does not explain the depletion of metallic iron in the Moon). These hypotheses also cannot account for the high angular momentum of the Earth–Moon system. The prevailing hypothesis today is that the Earth–Moon system formed as a result of a giant impact, where a Mars-sized body (named Theia) collided with the newly formed proto-Earth, blasting material into orbit around it, which accreted to form the Moon. Giant impacts are thought to have been common in the early Solar System. Computer simulations modelling a giant impact are consistent with measurements of the angular momentum of the Earth–Moon system and the small size of the lunar core. These simulations also show that most of the Moon came from the impactor, not from the proto-Earth. However more recent tests suggest more of the Moon coalesced from the Earth and not the impactor. Meteorites show that other inner Solar System bodies such as Mars and Vesta have very different oxygen and tungsten isotopic compositions to the Earth, while the Earth and Moon have near-identical isotopic compositions. Post-impact mixing of the vaporized material between the forming Earth and Moon could have equalized their isotopic compositions, although this is debated. In 2001, a team at the Carnegie Institute of Washington reported the most precise measurement of the isotopic signatures of lunar rocks. To their surprise, the team found that the rocks from the Apollo program carried an isotopic signature that was identical with rocks from Earth, and were different from almost all other bodies in the Solar System. Since most of the material that went into orbit to form the Moon was thought to come from Theia, this observation was unexpected. In 2007, researchers from the California Institute of Technology announced that there was less than a 1% chance that Theia and Earth had identical isotopic signatures. Published in 2012, an analysis of titanium isotopes in Apollo lunar samples showed that the Moon has the same composition as the Earth, which conflicts with what is expected if the Moon formed far from Earth's orbit or from Theia. Variations on GIH may explain this data. The Moon is the second densest satellite in the Solar System after Io. However, the inner core of the Moon is small, with a radius of about 350 km or less; this is only ~20% the size of the Moon, in contrast to the ~50% of most other terrestrial bodies[clarification needed]. Its composition is not well constrained, but it is probably metallic iron alloyed with a small amount of sulphur and nickel; analyses of the Moon's time-variable rotation indicate that it is at least partly molten. The dark irregular mare lava plains are prominent in the fully illuminated disk. A single bright star of ejecta, with rays stretching a third of the way across the disk, emblazons the lower centre: this is the crater Tycho. This full disk is nearly featureless, a uniform grey surface with almost no dark mare. There are many bright overlapping dots of impact craters. A grey, many-ridged surface from high above. The largest feature is a circular ringed structure with high walled sides and a lower central peak: the entire surface out to the horizon is filled with similar structures that are smaller and overlapping. Twenty degrees of latitude of the Moon's disk, completely covered in the overlapping circles of craters. The illumination angles are from all directions, keeping almost all the crater floors in sunlight, but a set of merged crater floors right at the south pole are completely shadowed. The Moon has an atmosphere so tenuous as to be nearly vacuum, with a total mass of less than 10 metric tons. The surface pressure of this small mass is around 3 × 10−15 atm (0.3 nPa); it varies with the lunar day. Its sources include outgassing and sputtering, the release of atoms from the bombardment of lunar soil by solar wind ions. Elements that have been detected include sodium and potassium, produced by sputtering, which are also found in the atmospheres of Mercury and Io; helium-4 from the solar wind; and argon-40, radon-222, and polonium-210, outgassed after their creation by radioactive decay within the crust and mantle. The absence of such neutral species (atoms or molecules) as oxygen, nitrogen, carbon, hydrogen and magnesium, which are present in the regolith, is not understood. Water vapour has been detected by Chandrayaan-1 and found to vary with latitude, with a maximum at ~60–70 degrees; it is possibly generated from the sublimation of water ice in the regolith. These gases can either return into the regolith due to the Moon's gravity or be lost to space, either through solar radiation pressure or, if they are ionized, by being swept away by the solar wind's magnetic field. The Moon's axial tilt with respect to the ecliptic is only 1.54°, much less than the 23.44° of the Earth. Because of this, the Moon's solar illumination varies much less with season, and topographical details play a crucial role in seasonal effects. From images taken by Clementine in 1994, it appears that four mountainous regions on the rim of Peary crater at the Moon's north pole may remain illuminated for the entire lunar day, creating peaks of eternal light. No such regions exist at the south pole. 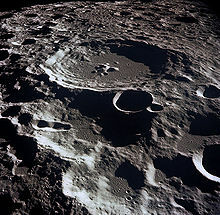 Similarly, there are places that remain in permanent shadow at the bottoms of many polar craters, and these dark craters are extremely cold: Lunar Reconnaissance Orbiter measured the lowest summer temperatures in craters at the southern pole at 35 K (−238 °C) and just 26 K close to the winter solstice in north polar Hermite Crater. This is the coldest temperature in the Solar System ever measured by a spacecraft, colder even than the surface of Pluto. The Earth has a pronounced axial tilt; the Moon's orbit is not perpendicular to Earth's axis, but lies close to the Earth's orbital plane. The Moon makes a complete orbit around the Earth with respect to the fixed stars about once every 27.3 days[g] (its sidereal period). However, since the Earth is moving in its orbit about the Sun at the same time, it takes slightly longer for the Moon to show the same phase to Earth, which is about 29.5 days[h] (its synodic period). Unlike most satellites of other planets, the Moon orbits nearer the ecliptic plane than to the planet's equatorial plane. The Moon's orbit is subtly perturbed by the Sun and Earth in many small, complex and interacting ways. For example, the plane of the Moon's orbital motion gradually rotates, which affects other aspects of lunar motion. These follow-on effects are mathematically described by Cassini's laws. The Moon has an exceptionally low albedo, giving it a similar reflectance to coal. Despite this, it is the second brightest object in the sky after the Sun. [i] This is partly due to the brightness enhancement of the opposition effect; at quarter phase, the Moon is only one-tenth as bright, rather than half as bright, as at full moon. Over one lunar month more than half of the Moon's surface can be seen from the surface of the Earth. The lunar surface also experiences tides of amplitude ~10 cm over 27 days, with two components: a fixed one due to the Earth, because they are in synchronous rotation, and a varying component from the Sun. The Earth-induced component arises from libration, a result of the Moon's orbital eccentricity; if the Moon's orbit were perfectly circular, there would only be solar tides. 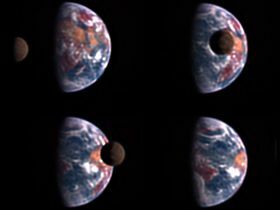 Libration also changes the angle from which the Moon is seen, allowing about 59% of its surface to be seen from the Earth (but only half at any instant). The cumulative effects of stress built up by these tidal forces produces moonquakes. Moonquakes are much less common and weaker than earthquakes, although they can last for up to an hour—a significantly longer time than terrestrial earthquakes—because of the absence of water to damp out the seismic vibrations. The existence of moonquakes was an unexpected discovery from seismometers placed on the Moon by Apollo astronauts from 1969 through 1972. The fiercely bright disk of the Sun is completely obscured by the exact fit of the disk of the dark, non-illuminated Moon, leaving only the radial, fuzzy, glowing coronal filaments of the Sun around the edge. The bright disk of the Sun, showing many coronal filaments, flares and grainy patches in the wavelength of this image, is partly obscured by a small dark disk: here, the Moon covers less than a fifteenth of the Sun. Eclipses can only occur when the Sun, Earth, and Moon are all in a straight line (termed "syzygy"). Solar eclipses occur at new moon, when the Moon is between the Sun and Earth. In contrast, lunar eclipses occur at full moon, when the Earth is between the Sun and Moon. The apparent size of the Moon is roughly the same as that of the Sun, with both being viewed at close to one-half a degree wide. The Sun is much larger than the Moon but it is the precise vastly greater distance that coincidentally gives it the same apparent size as the much closer and much smaller Moon from the perspective of the Earth. The variations in apparent size, due to the non-circular orbits, are nearly the same as well, though occurring in different cycles. This makes possible both total (with the Moon appearing larger than the Sun) and annular (with the Moon appearing smaller than the Sun) solar eclipses. In a total eclipse, the Moon completely covers the disc of the Sun and the solar corona becomes visible to the naked eye. Since the distance between the Moon and the Earth is very slowly increasing over time, the angular diameter of the Moon is decreasing. This means that hundreds of millions of years ago the Moon would always completely cover the Sun on solar eclipses, and no annular eclipses were possible. Likewise, about 600 million years from now (if the angular diameter of the Sun does not change), the Moon will no longer cover the Sun completely, and only annular eclipses will occur. As the Moon is continuously blocking our view of a half-degree-wide circular area of the sky,[j] the related phenomenon of occultation occurs when a bright star or planet passes behind the Moon and is occulted: hidden from view. In this way, a solar eclipse is an occultation of the Sun. Because the Moon is comparatively close to the Earth, occultations of individual stars are not visible everywhere on the planet, nor at the same time. Because of the precession of the lunar orbit, each year different stars are occulted. On an open folio page is a carefully drawn disk of the full moon. In the upper corners of the page are waving banners held aloft by pairs of winged cherubs. In the lower left page corner a cherub assists another to measure distances with a pair of compasses; in the lower right corner a cherub views the main map through a handheld telescope, while another, kneeling, peers at the map from over a low cloth-draped table. 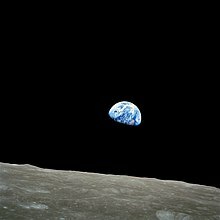 The small blue-white semicircle of the Earth, almost glowing with colour in the blackness of space, rising over the limb of the desolate, cratered surface of the Moon. The dark shadowed disk of the Moon moves across the face of the quarter-phase Earth, covering only a small part of the cloud-swirled semicircle. ^ The range of angular size values given are based on simple scaling of the following values given in the fact sheet reference: at an Earth-equator to Moon-centre distance of 378 000 km, the angular size is 1896 arcseconds. The same fact sheet gives extreme Earth–Moon distances of 407 000 km and 357 000 km. For the maximum angular size, the minimum distance has to be corrected for the Earth's equatorial radius of 6 378 km, giving 350 600 km. ^ Lucey et al. (2006) give 107 particles cm−3 by day and 105 particles cm−3 by night. Along with equatorial surface temperatures of 390 K by day and 100 K by night, the ideal gas law yields the pressures given in the infobox (rounded to the nearest order of magnitude): 10−7 Pa by day and 10−10 Pa by night. ^ There are a number of near-Earth asteroids including 3753 Cruithne that are co-orbital with Earth: their orbits bring them close to Earth for periods of time but then alter in the long term (Morais et al, 2002). These are quasi-satellites – they are not moons as they do not orbit the Earth. For more information, see Other moons of Earth. ^ Charon is proportionally larger in comparison to Pluto, but Pluto has been reclassified as a dwarf planet. ^ a b c d e f g h i j k l Wieczorek, M. et al. (2006). "The constitution and structure of the lunar interior". Reviews in Mineralogy and Geochemistry 60 (1): 221–364. doi:10.2138/rmg.2006.60.3. ^ a b c d e Williams, Dr. David R. (2 February 2006). "Moon Fact Sheet". NASA (National Space Science Data Center). Retrieved 31 December 2008. ^ Matthews, Grant (2008). "Celestial body irradiance determination from an underfilled satellite radiometer: application to albedo and thermal emission measurements of the Moon using CERES". Applied Optics 47 (27): 4981–93. Bibcode:2008ApOpt..47.4981M. doi:10.1364/AO.47.004981. PMID 18806861. ^ A.R. Vasavada, D.A. Paige, and S.E. Wood (1999). "Near-Surface Temperatures on Mercury and the Moon and the Stability of Polar Ice Deposits". Icarus 141 (2): 179. Bibcode:1999Icar..141..179V. doi:10.1006/icar.1999.6175. ^ a b c Lucey, P.; Korotev, Randy L. et al. (2006). "Understanding the lunar surface and space-Moon interactions". Reviews in Mineralogy and Geochemistry 60 (1): 83–219. doi:10.2138/rmg.2006.60.2. ^ Morais, M.H.M. ; Morbidelli, A. (2002). "The Population of Near-Earth Asteroids in Coorbital Motion with the Earth". Icarus 160 (1): 1–9. Bibcode:2002Icar..160....1M. doi:10.1006/icar.2002.6937. ^ "Naming Astronomical Objects: Spelling of Names". International Astronomical Union. Retrieved 29 March 2010. ^ "Gazetteer of Planetary Nomenclature: Planetary Nomenclature FAQ". USGS Astrogeology Research Program. Retrieved 29 March 2010. ^ Barnhart, Robert K. (1995). The Barnhart Concise Dictionary of Etymology. USA: Harper Collins. p. 487. ISBN 978-0-06-270084-1. ^ "Oxford English Dictionary: lunar, a. and n.". Oxford English Dictionary: Second Edition 1989. Oxford University Press. Retrieved 23 March 2010. ^ Kleine, T.; Palme, H.; Mezger, K.; Halliday, A.N. (2005). "Hf–W Chronometry of Lunar Metals and the Age and Early Differentiation of the Moon". Science 310 (5754): 1671–1674. Bibcode:2005Sci...310.1671K. doi:10.1126/science.1118842. PMID 16308422. ^ Binder, A.B. (1974). "On the origin of the Moon by rotational fission". The Moon 11 (2): 53–76. Bibcode:1974Moon...11...53B. doi:10.1007/BF01877794. ^ a b c Stroud, Rick (2009). The Book of the Moon. Walken and Company. pp. 24–27. ISBN 978-0-8027-1734-4. ^ Mitler, H.E. (1975). "Formation of an iron-poor moon by partial capture, or: Yet another exotic theory of lunar origin". Icarus 24 (2): 256–268. Bibcode:1975Icar...24..256M. doi:10.1016/0019-1035(75)90102-5. ^ Stevenson, D.J. (1987). "Origin of the moon–The collision hypothesis". Annual Review of Earth and Planetary Sciences 15 (1): 271–315. Bibcode:1987AREPS..15..271S. doi:10.1146/annurev.ea.15.050187.001415. ^ Taylor, G. Jeffrey (31 December 1998). "Origin of the Earth and Moon". Planetary Science Research Discoveries. Retrieved 7 April 2010. ^ Canup, R.; Asphaug, E. (2001). "Origin of the Moon in a giant impact near the end of the Earth's formation". Nature 412 (6848): 708–712. Bibcode:2001Natur.412..708C. doi:10.1038/35089010. PMID 11507633. ^ "Earth-Asteroid Collision Formed Moon Later Than Thought". News.nationalgeographic.com. 28 October 2010. Retrieved 7 May 2012. ^ Touboul, M.; Kleine, T.; Bourdon, B.; Palme, H.; Wieler, R. (2007). "Late formation and prolonged differentiation of the Moon inferred from W isotopes in lunar metals". Nature 450 (7173): 1206–9. Bibcode:2007Natur.450.1206T. doi:10.1038/nature06428. PMID 18097403. ^ Pahlevan, Kaveh; Stevenson, David J. (2007). "Equilibration in the aftermath of the lunar-forming giant impact". Earth and Planetary Science Letters 262 (3–4): 438–449. arXiv:1012.5323. Bibcode:2007E&PSL.262..438P. doi:10.1016/j.epsl.2007.07.055. ^ Nield, Ted (2009). "Moonwalk (summary of meeting at Meteoritical Society's 72nd Annual Meeting, Nancy, France)". Geoscientist 19: 8. ^ a b Warren, P. H. (1985). "The magma ocean concept and lunar evolution". Annual review of earth and planetary sciences. 13 (1): 201–240. Bibcode:1985AREPS..13..201W. doi:10.1146/annurev.ea.13.050185.001221. ^ Tonks, W. Brian; Melosh, H. Jay (1993). "Magma ocean formation due to giant impacts". Journal of Geophysical Research 98 (E3): 5319–5333. Bibcode:1993JGR....98.5319T. doi:10.1029/92JE02726. ^ Wiechert, U. et al. (October 2001). "Oxygen Isotopes and the Moon-Forming Giant Impact". Science (Science (journal)) 294 (12): 345–348. Bibcode:2001Sci...294..345W. doi:10.1126/science.1063037. PMID 11598294. Retrieved 2009-07-05. ^ Pahlevan, Kaveh; Stevenson, David (October 2007). "Equilibration in the Aftermath of the Lunar-forming Giant Impact". EPSL 262 (3–4): 438–449. arXiv:1012.5323. Bibcode:2007E&PSL.262..438P. doi:10.1016/j.epsl.2007.07.055. ^ Taylor, Stuart Ross (1975). Lunar science: A post-Apollo view. New York, Pergamon Press, Inc. p. 64. ^ "NASA Research Team Reveals Moon Has Earth-Like Core". NASA. 01.06.11. ^ Nemchin, A.; Timms, N.; Pidgeon, R.; Geisler, T.; Reddy, S.; Meyer, C. (2009). "Timing of crystallization of the lunar magma ocean constrained by the oldest zircon". Nature Geoscience 2 (2): 133–136. Bibcode:2009NatGe...2..133N. doi:10.1038/ngeo417. ^ a b Shearer, C. et al. (2006). "Thermal and magmatic evolution of the Moon". Reviews in Mineralogy and Geochemistry 60 (1): 365–518. doi:10.2138/rmg.2006.60.4. ^ Schubert, J. (2004). "Interior composition, structure, and dynamics of the Galilean satellites.". In F. Bagenal et al.. Jupiter: The Planet, Satellites, and Magnetosphere. Cambridge University Press. pp. 281–306. ISBN 978-0-521-81808-7. ^ Williams, J.G. ; Turyshev, S.G.; Boggs, D.H.; Ratcliff, J.T. (2006). "Lunar laser ranging science: Gravitational physics and lunar interior and geodesy". Advances in Space Research 37 (1): 6771. arXiv:gr-qc/0412049. Bibcode:2006AdSpR..37...67W. doi:10.1016/j.asr.2005.05.013. ^ "Landscapes from the ancient and eroded lunar far side". esa. Retrieved 15 February 2010. ^ Spudis, Paul D.; Cook, A.; Robinson, M.; Bussey, B.; Fessler, B.; Cook; Robinson; Bussey; Fessler (01/1998). "Topography of the South Polar Region from Clementine Stereo Imaging". Workshop on New Views of the Moon: Integrated Remotely Sensed, Geophysical, and Sample Datasets: 69. Bibcode:1998nvmi.conf...69S. ^ a b c Spudis, Paul D.; Reisse, Robert A.; Gillis, Jeffrey J. (1994). "Ancient Multiring Basins on the Moon Revealed by Clementine Laser Altimetry". Science 266 (5192): 1848–1851. Bibcode:1994Sci...266.1848S. doi:10.1126/science.266.5192.1848. PMID 17737079. ^ Pieters, C.M. ; Tompkins, S.; Head, J.W. ; Hess, P.C. (1997). "Mineralogy of the Mafic Anomaly in the South Pole‐Aitken Basin: Implications for excavation of the lunar mantle". Geophysical Research Letters 24 (15): 1903–1906. Bibcode:1997GeoRL..24.1903P. doi:10.1029/97GL01718. ^ Taylor, G.J. (17 July 1998). "The Biggest Hole in the Solar System". Planetary Science Research Discoveries, Hawai'i Institute of Geophysics and Planetology. Retrieved 12 April 2007. ^ Schultz, P. H. (03/1997). "Forming the south-pole Aitken basin – The extreme games". Conference Paper, 28th Annual Lunar and Planetary Science Conference 28: 1259. Bibcode:1997LPI....28.1259S. ^ Wlasuk, Peter (2000). Observing the Moon. Springer. p. 19. ISBN 978-1-85233-193-1. ^ Norman, M. (21 April 2004). "The Oldest Moon Rocks". Planetary Science Research Discoveries. Retrieved 12 April 2007. ^ Varricchio, L. (2006). Inconstant Moon. Xlibris Books. ISBN 978-1-59926-393-9. ^ Head, L.W.J.W. (2003). "Lunar Gruithuisen and Mairan domes: Rheology and mode of emplacement". Journal of Geophysical Research 108 (E2): 5012. Bibcode:2003JGRE..108.5012W. doi:10.1029/2002JE001909. Retrieved 12 April 2007. ^ Gillis, J.J.; Spudis; Spudis, P.D. (1996). "The Composition and Geologic Setting of Lunar Far Side Maria". Lunar and Planetary Science 27: 413–404. Bibcode:1996LPI....27..413G. ^ Lawrence, D. J. et al. (11 August 1998). "Global Elemental Maps of the Moon: The Lunar Prospector Gamma-Ray Spectrometer". Science (HighWire Press) 281 (5382): 1484–1489. Bibcode:1998Sci...281.1484L. doi:10.1126/science.281.5382.1484. ISSN 1095-9203. PMID 9727970. Retrieved 29 August 2009. ^ Taylor, G.J. (31 August 2000). "A New Moon for the Twenty-First Century". Planetary Science Research Discoveries, Hawai'i Institute of Geophysics and Planetology. Retrieved 12 April 2007. ^ a b Hiesinger, H.; Head, J.W. ; Wolf, U.; Jaumanm, R.; Neukum, G. (2003). "Ages and stratigraphy of mare basalts in Oceanus Procellarum, Mare Numbium, Mare Cognitum, and Mare Insularum". J. Geophys. Res. 108 (E7): 1029. Bibcode:2003JGRE..108.5065H. doi:10.1029/2002JE001985. ^ Munsell, K. (4 December 2006). "Majestic Mountains". Solar System Exploration. NASA. Retrieved 12 April 2007. ^ Richard Lovett. "Early Earth may have had two moons : Nature News". Nature.com. Retrieved 2012-11-01. ^ "Was our two-faced moon in a small collision?". Theconversation.edu.au. Retrieved 2012-11-01. ^ Melosh, H. J. (1989). Impact cratering: A geologic process. Oxford Univ. Press. ISBN 978-0-19-504284-9. ^ "Moon Facts". SMART-1. European Space Agency. 2010. Retrieved 12 May 2010. ^ "Gazetteer of Planetary Nomenclature: Categories for Naming Features on Planets and Satellites". U.S. Geological Survey. Retrieved 8 April 2010. ^ a b Wilhelms, Don (1987). "Relative Ages". Geologic History of the Moon. U.S. Geological Survey. ^ "The Smell of Moondust". NASA. 30 January 2006. Retrieved 15 March 2010. ^ Heiken, G.; Vaniman, D.; French, B. (eds.) (1991). Lunar Sourcebook, a user's guide to the Moon. New York: Cambridge University Press. p. 736. ISBN 978-0-521-33444-0. ^ Rasmussen, K.L. ; Warren, P.H. (1985). "Megaregolith thickness, heat flow, and the bulk composition of the Moon". Nature 313 (5998): 121–124. Bibcode:1985Natur.313..121R. doi:10.1038/313121a0. ^ Margot, J. L.; Campbell, D. B.; Jurgens, R. F.; Slade, M. A. (4 June 1999). "Topography of the Lunar Poles from Radar Interferometry: A Survey of Cold Trap Locations". Science 284 (5420): 1658–1660. Bibcode:1999Sci...284.1658M. doi:10.1126/science.284.5420.1658. PMID 10356393. ^ Ward, William R. (1 August 1975). "Past Orientation of the Lunar Spin Axis". Science 189 (4200): 377–379. Bibcode:1975Sci...189..377W. doi:10.1126/science.189.4200.377. PMID 17840827. ^ a b Martel, L. M. V. (4 June 2003). "The Moon's Dark, Icy Poles". Planetary Science Research Discoveries, Hawai'i Institute of Geophysics and Planetology. Retrieved 12 April 2007. ^ Seedhouse, Erik (2009). Lunar Outpost: The Challenges of Establishing a Human Settlement on the Moon. Springer-Praxis Books in Space Exploration. Germany: Springer Praxis. p. 136. ISBN 978-0-387-09746-6. ^ Coulter, Dauna (18 March 2010). "The Multiplying Mystery of Moonwater". Science@NASA. Retrieved 28 March 2010. ^ Spudis, P. (6 November 2006). "Ice on the Moon". The Space Review. Retrieved 12 April 2007. ^ Feldman, W. C.; S. Maurice, A. B. Binder, B. L. Barraclough, R. C. Elphic, D. J. Lawrence (1998). "Fluxes of Fast and Epithermal Neutrons from Lunar Prospector: Evidence for Water Ice at the Lunar Poles". Science 281 (5382): 1496–1500. Bibcode:1998Sci...281.1496F. doi:10.1126/science.281.5382.1496. PMID 9727973. ^ Saal, Alberto E.; Hauri, Erik H.; Cascio, Mauro L.; van Orman, James A.; Rutherford, Malcolm C.; Cooper, Reid F. (2008). "Volatile content of lunar volcanic glasses and the presence of water in the Moon's interior". Nature 454 (7201): 192–195. Bibcode:2008Natur.454..192S. doi:10.1038/nature07047. PMID 18615079. ^ Pieters, C. M.; Goswami, J. N.; Clark, R. N.; Annadurai, M.; Boardman, J.; Buratti, B.; Combe, J.-P.; Dyar, M. D.; Green, R.; Head, J. W.; Hibbitts, C.; Hicks, M.; Isaacson, P.; Klima, R.; Kramer, G.; Kumar, S.; Livo, E.; Lundeen, S.; Malaret, E.; McCord, T.; Mustard, J.; Nettles, J.; Petro, N.; Runyon, C.; Staid, M.; Sunshine, J.; Taylor, L. A.; Tompkins, S.; Varanasi, P. (2009). "Character and Spatial Distribution of OH/H2O on the Surface of the Moon Seen by M3 on Chandrayaan-1". Science 326 (5952): 568–72. Bibcode:2009Sci...326..568P. doi:10.1126/science.1178658. PMID 19779151. ^ Lakdawalla, Emily (13 November 2009). "LCROSS Lunar Impactor Mission: "Yes, We Found Water!"". The Planetary Society. Retrieved 13 April 2010. ^ Colaprete, A.; Ennico; Wooden; Shirley; Heldmann; Marshall; Sollitt; Asphaug; Korycansky; Ennico, K.; Wooden, D.; Shirley, M.; Heldmann, J.; Marshall, W.; Sollitt, L.; Asphaug, E.; Korycansky, D.; Schultz, P.; Hermalyn, B.; Galal, K.; Bart, G. D.; Goldstein, D.; Summy, D. (1–5 March 2010). "Water and More: An Overview of LCROSS Impact Results". 41st Lunar and Planetary Science Conference 41 (1533): 2335. Bibcode:2010LPI....41.2335C. ^ Colaprete, A.; Schultz, P.; Heldmann, J.; Wooden, D.; Shirley, M.; Ennico, K.; Hermalyn, B.; Marshall, W; Ricco, A.; Elphic, R. C.; Goldstein, D.; Summy, D.; Bart, G. D.; Asphaug, E.; Korycansky, D.; Landis, D.; Sollitt, L. (22 October 2010). "Detection of Water in the LCROSS Ejecta Plume". Science 330 (6003): 463–468. Bibcode:2010Sci...330..463C. doi:10.1126/science.1186986. PMID 20966242. ^ Hauri, Erik; Thomas Weinreich, Albert E. Saal, Malcolm C. Rutherford, James A. Van Orman (26 May 2011). "High Pre-Eruptive Water Contents Preserved in Lunar Melt Inclusions". Science Express 10 (1126): 213. Bibcode:2011Sci...333..213H. doi:10.1126/science.1204626. ^ Muller, P.; Sjogren, W. (1968). "Mascons: lunar mass concentrations". Science 161 (3842): 680–684. Bibcode:1968Sci...161..680M. doi:10.1126/science.161.3842.680. PMID 17801458. ^ Richard A. Kerr (12 April 2013). "The Mystery of Our Moon's Gravitational Bumps Solved?". Science 340: 128. ^ Konopliv, A.; Asmar, S.; Carranza, E.; Sjogren, W.; Yuan, D. (2001). "Recent gravity models as a result of the Lunar Prospector mission". Icarus 50 (1): 1–18. Bibcode:2001Icar..150....1K. doi:10.1006/icar.2000.6573. ^ Garrick-Bethell, Ian; Weiss, iBenjamin P.; Shuster, David L.; Buz, Jennifer (2009). "Early Lunar Magnetism". Science 323 (5912): 356–359. Bibcode:2009Sci...323..356G. doi:10.1126/science.1166804. PMID 19150839. ^ "Magnetometer / Electron Reflectometer Results". Lunar Prospector (NASA). 2001. Retrieved 17 March 2010. ^ Hood, L.L. ; Huang, Z. (1991). "Formation of magnetic anomalies antipodal to lunar impact basins: Two-dimensional model calculations". J. Geophys. Res. 96 (B6): 9837–9846. Bibcode:1991JGR....96.9837H. doi:10.1029/91JB00308. ^ Globus, Ruth (1977). "Chapter 5, Appendix J: Impact Upon Lunar Atmosphere". In Richard D. Johnson & Charles Holbrow. Space Settlements: A Design Study. NASA. Retrieved 17 March 2010. ^ Crotts, Arlin P.S. (2008). "Lunar Outgassing, Transient Phenomena and The Return to The Moon, I: Existing Data" (PDF). The Astrophysical Journal (Department of Astronomy, Columbia University) 687: 692. Bibcode:2008ApJ...687..692C. doi:10.1086/591634. Retrieved 29 September 2009. ^ a b c Stern, S.A. (1999). "The Lunar atmosphere: History, status, current problems, and context". Rev. Geophys. 37 (4): 453–491. Bibcode:1999RvGeo..37..453S. doi:10.1029/1999RG900005. ^ Lawson, S.; Feldman, W.; Lawrence, D.; Moore, K.; Elphic, R.; Belian, R. (2005). "Recent outgassing from the lunar surface: the Lunar Prospector alpha particle spectrometer". J. Geophys. Res. 110 (E9): 1029. Bibcode:2005JGRE..11009009L. doi:10.1029/2005JE002433. ^ Sridharan, R.; S.M. Ahmed, Tirtha Pratim Dasa, P. Sreelathaa, P. Pradeepkumara, Neha Naika, and Gogulapati Supriya (2010). "'Direct' evidence for water (H2O) in the sunlit lunar ambience from CHACE on MIP of Chandrayaan I". Planetary and Space Science 58 (6): 947. Bibcode:2010P&SS...58..947S. doi:10.1016/j.pss.2010.02.013. ^ a b Amos, Jonathan (16 December 2009). "'Coldest place' found on the Moon". BBC News. Retrieved 20 March 2010. ^ "Diviner News". UCLA. 17 September 2009. Retrieved 17 March 2010. ^ V V Belet︠s︡kiĭ (2001). Essays on the Motion of Celestial Bodies. Birkhäuser. p. 183. ISBN 978-3-7643-5866-2. ^ "Space Topics: Pluto and Charon". The Planetary Society. Retrieved 6 April 2010. ^ "Planet Definition Questions & Answers Sheet". International Astronomical Union. 2006. Retrieved 24 March 2010. ^ Alexander, M. E. (1973). "The Weak Friction Approximation and Tidal Evolution in Close Binary Systems". Astrophysics and Space Science 23 (2): 459–508. Bibcode:1973Ap&SS..23..459A. doi:10.1007/BF00645172. ^ Phil Plait. "Dark Side of the Moon". Bad Astronomy:Misconceptions. Retrieved 15 February 2010. ^ Luciuk, Mike. "How Bright is the Moon?". Amateur Astronomers, Inc. Retrieved 16 March 2010. ^ Spekkens, K. (18 October 2002). "Is the Moon seen as a crescent (and not a "boat") all over the world?". Curious About Astronomy. Retrieved 16 March 2010. ^ "Full moon tonight is as close as it gets". The Press Enterprise. 18 March 2011. Retrieved 19 March 2011. ^ Dr. Tony Phillips (16 March 2011). "Super Full Moon". NASA. Retrieved 19 March 2011. ^ Richard K. De Atley (18 March 2011). "Full moon tonight is as close as it gets". The Press-Enterprise. Retrieved 19 March 2011. ^ "'Super moon' to reach closest point for almost 20 years". The Guardian. 19 March 2011. Retrieved 19 March 2011. ^ Taylor, G.J. (8 November 2006). "Recent Gas Escape from the Moon". Planetary Science Research Discoveries, Hawai'i Institute of Geophysics and Planetology. Retrieved 4 April 2007. ^ Schultz, P.H. ; Staid, M.I. ; Pieters, C.M. (2006). "Lunar activity from recent gas release". Nature 444 (7116): 184–186. Bibcode:2006Natur.444..184S. doi:10.1038/nature05303. PMID 17093445. ^ "22 Degree Halo: a ring of light 22 degrees from the sun or moon". Department of Atmospheric Sciences at the University of Illinois at Urbana-Champaign. Retrieved 13 April 2010. ^ a b c d e Lambeck, K. (1977). "Tidal Dissipation in the Oceans: Astronomical, Geophysical and Oceanographic Consequences". Philosophical Transactions for the Royal Society of London. Series A, Mathematical and Physical Sciences 287 (1347): 545–594. Bibcode:1977RSPTA.287..545L. doi:10.1098/rsta.1977.0159. ^ Le Provost, C.; Bennett, A. F.; Cartwright, D. E. (1995). "Ocean Tides for and from TOPEX/POSEIDON". Science 267 (5198): 639–42. Bibcode:1995Sci...267..639L. doi:10.1126/science.267.5198.639. PMID 17745840. ^ a b c d Touma, Jihad; Wisdom, Jack (1994). "Evolution of the Earth-Moon system". The Astronomical Journal 108 (5): 1943–1961. Bibcode:1994AJ....108.1943T. doi:10.1086/117209. ^ Chapront, J.; Chapront-Touzé, M.; Francou, G. (2002). "A new determination of lunar orbital parameters, precession constant and tidal acceleration from LLR measurements". Astronomy and Astrophysics 387 (2): 700–709. Bibcode:2002A&A...387..700C. doi:10.1051/0004-6361:20020420. ^ Ray, R. (15 May 2001). "Ocean Tides and the Earth's Rotation". IERS Special Bureau for Tides. Retrieved 17 March 2010. ^ Murray, C.D. and Dermott, S.F. ; Stanley F. Dermott (1999). Solar System Dynamics. Cambridge University Press. p. 184. ISBN 978-0-521-57295-8. ^ Latham, Gary; Ewing, Maurice; Dorman, James; Lammlein, David; Press, Frank; Toksőz, Naft; Sutton, George; Duennebier, Fred et al. (1972). "Moonquakes and lunar tectonism". Earth, Moon, and Planets 4 (3–4): 373–382. Bibcode:1972Moon....4..373L. doi:10.1007/BF00562004. ^ Phillips, Tony (12 March 2007). "Stereo Eclipse". Science@NASA. Retrieved 17 March 2010. ^ Espenak, F. (2000). "Solar Eclipses for Beginners". MrEclipse. Retrieved 17 March 2010. ^ a b Thieman, J.; Keating, S. (2 May 2006). "Eclipse 99, Frequently Asked Questions". NASA. Retrieved 12 April 2007. ^ Espenak, F. "Saros Cycle". NASA. Retrieved 17 March 2010. ^ Guthrie, D.V. (1947). "The Square Degree as a Unit of Celestial Area". Popular Astronomy 55: 200–203. Bibcode:1947PA.....55..200G. ^ "Total Lunar Occultations". Royal Astronomical Society of New Zealand. Retrieved 17 March 2010. ^ Aaboe, A.; Britton, J. P.; Henderson,, J. A.; Neugebauer, Otto; Sachs, A. J. (1991). "Saros Cycle Dates and Related Babylonian Astronomical Texts". Transactions of the American Philosophical Society (American Philosophical Society) 81 (6): 1–75. doi:10.2307/1006543. JSTOR 1006543. "One comprises what we have called "Saros Cycle Texts", which give the months of eclipse possibilities arranged in consistent cycles of 223 months (or 18 years)." ^ Sarma, K. V. (2008). "Astronomy in India". In Helaine Selin. Encyclopaedia of the History of Science, Technology, and Medicine in Non-Western Cultures (2 ed.). Springer. pp. 317–321. ISBN 978-1-4020-4559-2. ^ Needham 1986, p. 411. ^ O'Connor, J.J.; Robertson, E.F. (February 1999). "Anaxagoras of Clazomenae". University of St Andrews. Retrieved 12 April 2007. ^ Needham 1986, p. 227. ^ Needham 1986, p. 413–414. ^ Robertson, E. F. (November 2000). "Aryabhata the Elder". Scotland: School of Mathematics and Statistics, University of St Andrews. Retrieved 15 April 2010. ^ Needham 1986, p. 415–416. ^ Lewis, C. S. (1964). The Discarded Image. Cambridge: Cambridge University Press. p. 108. ISBN 978-0-521-47735-2. ^ van der Waerden, Bartel Leendert (1987). "The Heliocentric System in Greek, Persian and Hindu Astronomy". Annals of the New York Academy of Sciences 500: 1–569. Bibcode:1987NYASA.500....1A. doi:10.1111/j.1749-6632.1987.tb37193.x. PMID 3296915. ^ "Discovering How Greeks Computed in 100 B.C.". The New York Times. 31 July 2008. Retrieved 27 March 2010. ^ Van Helden, A. (1995). "The Moon". Galileo Project. Retrieved 12 April 2007. ^ Consolmagno, Guy J. (1996). "Astronomy, Science Fiction and Popular Culture: 1277 to 2001 (And beyond)". Leonardo (The MIT Press) 29 (2): 128. doi:10.2307/1576348. JSTOR 1576348. ^ Hall, R. Cargill (1977). "Appendix A: LUNAR THEORY BEFORE 1964". NASA History Series. LUNAR IMPACT: A History of Project Ranger. Washington, D.C.: Scientific and Technical Information Office, NATIONAL AERONAUTICS AND SPACE ADMINISTRATION. Retrieved 13 April 2010. ^ Zak, Anatoly (2009). "Russia's unmanned missions toward the Moon". Retrieved 20 April 2010. ^ "Rocks and Soils from the Moon". NASA. Retrieved 6 April 2010. ^ Coren, M. (26 July 2004). "'Giant leap' opens world of possibility". CNN. Retrieved 16 March 2010. ^ "Record of Lunar Events, 24 July 1969". Apollo 11 30th anniversary. NASA. Retrieved 13 April 2010. ^ Martel, Linda M. V. (21 December 2009). "Celebrated Moon Rocks --- Overview and status of the Apollo lunar collection: A unique, but limited, resource of extraterrestrial material.". Planetary Science and Research Discoveries. Retrieved 6 April 2010. ^ Launius, Roger D. (July 1999). "The Legacy of Project Apollo". NASA History Office. Retrieved 13 April 2010. ^ SP-287 What Made Apollo a Success? A series of eight articles reprinted by permission from the March 1970 issue of Astronautics & Aeronautics, a publicaion of the American Institute of Aeronautics and Astronautics. Washington, D.C.: Scientific and Technical Information Office, National Aeronautics and Space Administration. 1971. ^ "NASA news release 77-47 page 242" (PDF) (Press release). 1 September 1977. Retrieved 16 March 2010. ^ Appleton, James; Radley, Charles; Deans, John; Harvey, Simon; Burt, Paul; Haxell, Michael; Adams, Roy; Spooner N.; Brieske, Wayne (1977). "OASI Newsletters Archive". NASA Turns A Deaf Ear To The Moon. Archived from the original on 10 December 2007. Retrieved 29 August 2007. ^ Dickey, J. et al. (1994). "Lunar laser ranging: a continuing legacy of the Apollo program". Science 265 (5171): 482–490. Bibcode:1994Sci...265..482D. doi:10.1126/science.265.5171.482. PMID 17781305. ^ "Hiten-Hagomoro". NASA. Retrieved 29 March 2010. ^ "Clementine information". NASA. 1994. Retrieved 29 March 2010. ^ "Lunar Prospector: Neutron Spectrometer". NASA. 2001. Retrieved 29 March 2010. ^ "SMART-1 factsheet". European Space Agency. 26 February 2007. Retrieved 29 March 2010. ^ "China's first lunar probe ends mission". Xinhua. 1 March 2009. Retrieved 29 March 2010. ^ "KAGUYA Mission Profile". JAXA. Retrieved 13 April 2010. ^ "KAGUYA (SELENE) World's First Image Taking of the Moon by HDTV". Japan Aerospace Exploration Agency (JAXA) and NHK (Japan Broadcasting Corporation). 7 November 2007. Retrieved 13 April 2010. ^ "Mission Sequence". Indian Space Research Organisation. 17 November 2008. Retrieved 13 April 2010. ^ "Indian Space Research Organisation: Future Program". Indian Space Research Organisation. Retrieved 13 April 2010. ^ "India and Russia Sign an Agreement on Chandrayaan-2". Indian Space Research Organisation. 14 November 2007. Archived from the original on 17 December 2007. Retrieved 13 April 2010. ^ "Lunar CRater Observation and Sensing Satellite (LCROSS): Strategy & Astronomer Observation Campaign". NASA. October 2009. Retrieved 13 April 2010. ^ "Giant moon crater revealed in spectacular up-close photos". MSNBC. Space.com. 6 January 2012. ^ Chang, Alicia (26 December 2011). "Twin probes to circle moon to study gravity field". The Sun News. Associated Press. Retrieved 27 December 2011. ^ Covault, C. (4 June 2006). "Russia Plans Ambitious Robotic Lunar Mission". Aviation Week. Retrieved 12 April 2007. ^ "Russia to send mission to Mars this year, Moon in three years". "TV-Novosti". 25 February 2009. Retrieved 13 April 2010. ^ "About the Google Lunar X Prize". X-Prize Foundation. 2010. Archived from the original on 28 February 2010. Retrieved 24 March 2010. ^ Wall, Mike (14 January 2011). "Mining the Moon's Water: Q&A with Shackleton Energy's Bill Stone". Space News. ^ "President Bush Offers New Vision For NASA" (Press release). NASA. 14 December 2004. Retrieved 12 April 2007. ^ "Constellation". NASA. Retrieved 13 April 2010. ^ "NASA Unveils Global Exploration Strategy and Lunar Architecture" (Press release). NASA. 4 December 2006. Retrieved 12 April 2007. ^ NASAtelevision (15 April 2010). "President Obama Pledges Total Commitment to NASA". YouTube. Retrieved 7 May 2012. ^ "India's Space Agency Proposes Manned Spaceflight Program". SPACE.com. 10 November 2006. Retrieved 23 October 2008. ^ Takahashi, Yuki (September 1999). "Mission Design for Setting up an Optical Telescope on the Moon". California Institute of Technology. Retrieved 27 March 2011. ^ Chandler, David (15 February 2008). 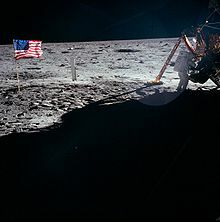 "MIT to lead development of new telescopes on moon". MIT News. Retrieved 27 March 2011. ^ Naeye, Robert (6 April 2008). "NASA Scientists Pioneer Method for Making Giant Lunar Telescopes". Goddard Space Flight Center. Retrieved 27 March 2011. ^ Bell, Trudy (9 October 2008). "Liquid Mirror Telescopes on the Moon". Science News. NASA. Retrieved 27 March 2011. ^ a b "Can any State claim a part of outer space as its own?". United Nations Office for Outer Space Affairs. Retrieved 28 March 2010. ^ "How many States have signed and ratified the five international treaties governing outer space?". United Nations Office for Outer Space Affairs. 1 January 2006. Retrieved 28 March 2010. ^ "Do the five international treaties regulate military activities in outer space?". United Nations Office for Outer Space Affairs. Retrieved 28 March 2010. ^ "Agreement Governing the Activities of States on the Moon and Other Celestial Bodies". United Nations Office for Outer Space Affairs. Retrieved 28 March 2010. ^ "The treaties control space-related activities of States. What about non-governmental entities active in outer space, like companies and even individuals?". United Nations Office for Outer Space Affairs. Retrieved 28 March 2010. ^ "Statement by the Board of Directors of the IISL On Claims to Property Rights Regarding The Moon and Other Celestial Bodies (2004)". International Institute of Space Law. 2004. Retrieved 28 March 2010. ^ "Further Statement by the Board of Directors of the IISL On Claims to Lunar Property Rights (2009)". International Institute of Space Law. 22 March 2009. Retrieved 28 March 2010. ^ Brooks, A. S. and Smith, C. C. (1987): "Ishango revisited: new age determinations and cultural interpretations", The African Archaeological Review, 5 : 65–78. ^ Duncan, David Ewing (1998). The Calendar. Fourth Estate Ltd. pp. 10–11. ISBN 978-1-85702-721-1. ^ For etymology, see Barnhart, Robert K. (1995). The Barnhart Concise Dictionary of Etymology. Harper Collins. p. 487. ISBN 978-0-06-270084-1. For the lunar calendar of the Germanic peoples, see Birley, A. R. (Trans.) (1999). Agricola and Germany. Oxford World's Classics. USA: Oxford. p. 108. ISBN 978-0-19-283300-6. ^ Smith, William George (1849). Dictionary of Greek and Roman Biography and Mythology: Oarses-Zygia 3. J. Walton. p. 768. Retrieved 29 March 2010. ^ Estienne, Henri (1846). Thesaurus graecae linguae 5. Didot. p. 1001. Retrieved 29 March 2010. ^ "Carved and Drawn Prehistoric Maps of the Cosmos". Space Today Online. 2006. Retrieved 12 April 2007. ^ a b Lilienfeld, Scott O.; Arkowitz, Hal (2009). "Lunacy and the Full Moon". Scientific American. Retrieved 13 April 2010. Jolliff, B.; Wieczorek, M.; Shearer, C.; Neal, C. (eds.) (2006). "New views of the Moon". Rev. Mineral. Geochem. (Chantilly, Virginia: Min. Soc. Amer.) 60 (1): 721. doi:10.2138/rmg.2006.60.0. ISBN 0-939950-72-3. Retrieved 12 April 2007. Jones, E.M. (2006). "Apollo Lunar Surface Journal". NASA. Retrieved 12 April 2007. "Exploring the Moon". Lunar and Planetary Institute. Retrieved 12 April 2007. "Moon Articles". Planetary Science Research Discoveries. Spudis, P. D. (1996). The Once and Future Moon. Smithsonian Institution Press. ISBN 1-56098-634-4. Teague, K. (2006). "The Project Apollo Archive". Retrieved 12 April 2007. Wilhelms, D.E. (1987). "Geologic History of the Moon". U.S. Geological Survey Professional paper 1348. Retrieved 12 April 2007. Wilhelms, D.E. (1993). To a Rocky Moon: A Geologist's History of Lunar Exploration. Tucson, Arizona: University of Arizona Press. ISBN 0-8165-1065-2. Retrieved 10 March 2009. "Consolidated Lunar Atlas". Lunar and Planetary Institute. Retrieved 26 February 2012. "Clementine Lunar Image Browser". U.S. Navy. 15 October 2003. Retrieved 12 April 2007. "Google Moon". Google. 2007. Retrieved 12 April 2007. "Moon". World Wind Central. NASA. 2007. Retrieved 12 April 2007. "NASA's SKYCAL—Sky Events Calendar". NASA Eclipse Home Page. Retrieved 27 August 2007. "Find moonrise, moonset and moonphase for a location". 2008. Retrieved 18 February 2008. "HMNAO's Moon Watch". 2005. Retrieved 24 May 2009. See when the next new crescent moon is visible for any location. This page was last modified on 5 May 2013 at 08:59.